On Sunday, 25th October, we set off from Newark and up the A1 on our way up to Yorkshire. Along with us was the younger of our two daughters, Louise (afairymind on WordPress). The three of us had decided to have a day out at Fountains Abbey to celebrate our wedding anniversary and Lou’s birthday the previous day. Fountains Abbey is one of the best preserved Cistercian abbeys in England and is located 3 miles south-west of Ripon, near to the village of Aldfield in North Yorkshire. The first monks came to this valley on December 27th 1132. The thirteen devout monks had become dissatisfied with the extravagant lifestyle of the monks at the Benedictine Abbey in York and wanted to return to the simpler teachings of St. Benedict. This led to a riot, and under the protection of Thurstan, the Archbishop of York, they fled the abbey to stay at his palace in Ripon. The archbishop’s lands included those alongside the River Skell, which he granted to these monks in order to build their new abbey. The monks survived the winter by sleeping beneath an elm tree, with only straw for covering themselves. Their only food was the bread sent to them by Archbishop Thurstan. Desperate for help they wrote to Bernard, Abbot of Clairvaux in France, who willingly offered to help. Building work continued until all the structures necessary to the running of a monastery had been completed. 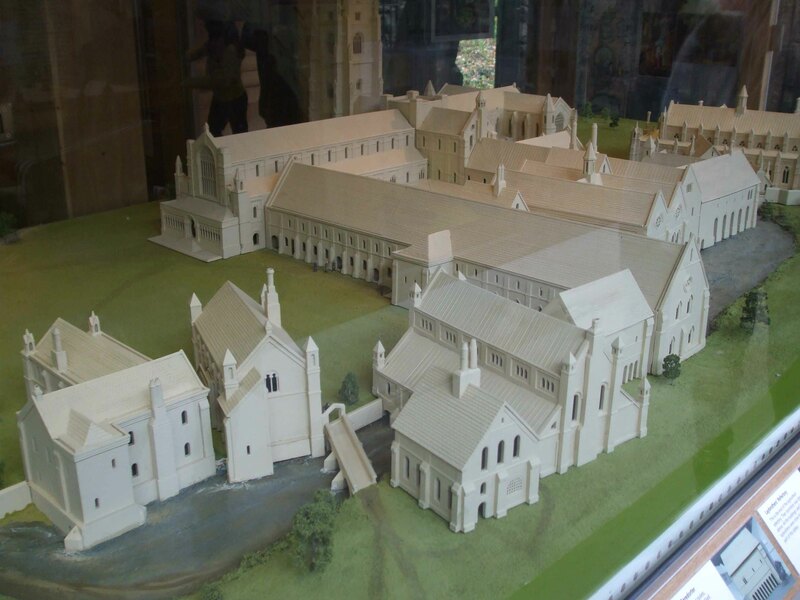 These would include: a Guest House, an Infirmary for sick and elderly monks, the Abbot’s House and a Chapter House. 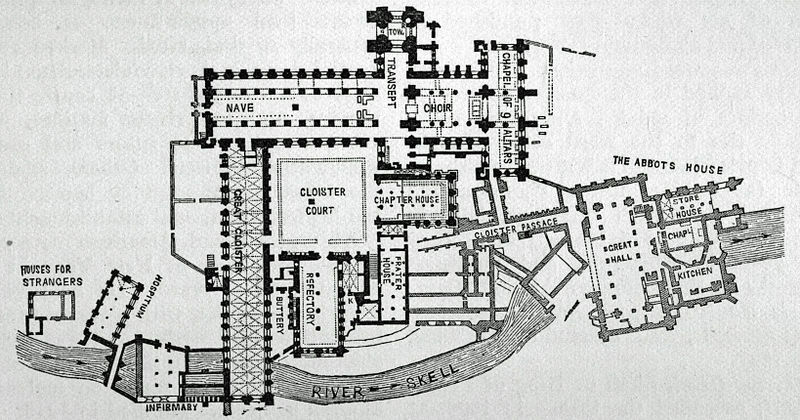 Several rooms, some set around the open Cloister, such as the Refrectory (dining room) Warming house and Library, served for everyday needs. Trouble struck in the 1290s when the abbey’s own financial mismanagement led to debts. Sheep disease, and failed harvests due to the changing climate, made the situation very serious. On top of all this were the raids by the Scots (famine in Scotland was severe) followed by the Black Death of 1349-50. The Black Death killed a third of the population of the country, including monks. There were now too few lay brothers o work the land, so it was rented out to provide income. In the late 1400s, powerful abbots began a revival, which included the building of Huby’s Tower, still seen today. 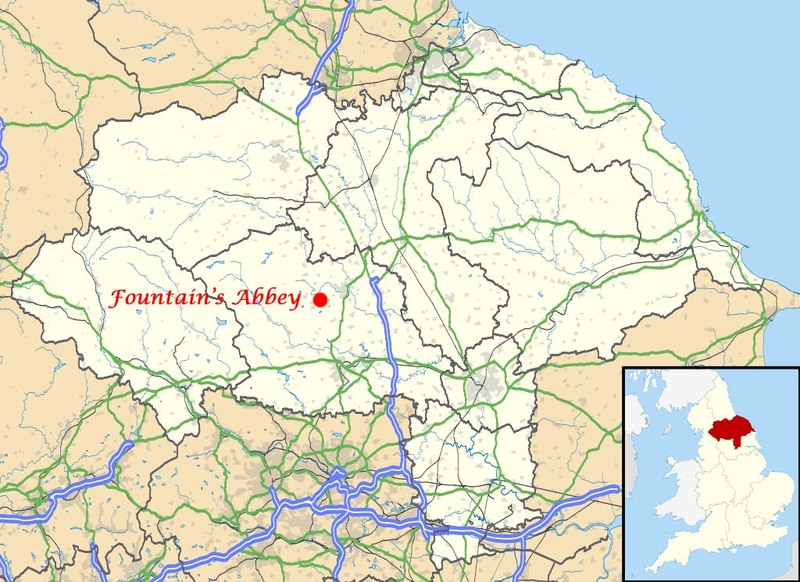 More and more monks were attracted to Fountains and, once again, it became the richest abbey in England … but not for long. 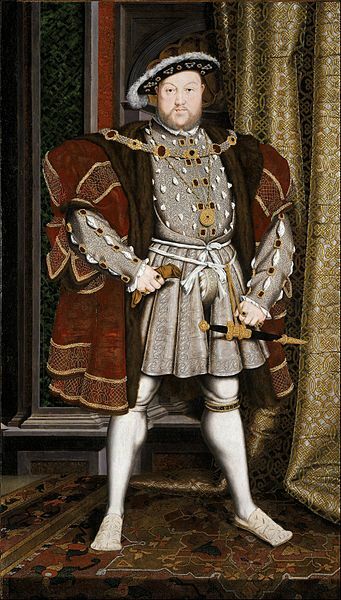 Henry VIII’s disagreements with the pope over his divorce from Catherine of Aragon, together with his need for more funds, led to the Dissolution of the Monasteries. At Fountains Abbey, the deeds of surrender were signed in the Chapter House in 1539 – ending over 400 years of worship at the abbey. The lands were sold to raise money for Henry. Its new owner was Richard Gresham, who bought the estate for a hefty £11,000. The one condition of sale was that Gresham should render the Abbey Church and Chapter House unfit for religious use. The roofs were pulled down using horse and rope, and the lead from them and glass from the windows were sold by to offset the hefty purchase price he’d paid. With no monastic community to support them, the tannery, brewery, and other workshops just fell into disrepair. The abbey stone became a source of ready-cut building stone for anyone who wanted to buy it. Gresham and his family rarely visited but 60 years later a local man, Stephen Proctor bought the Fountains Abbey Estate and surrounding land. 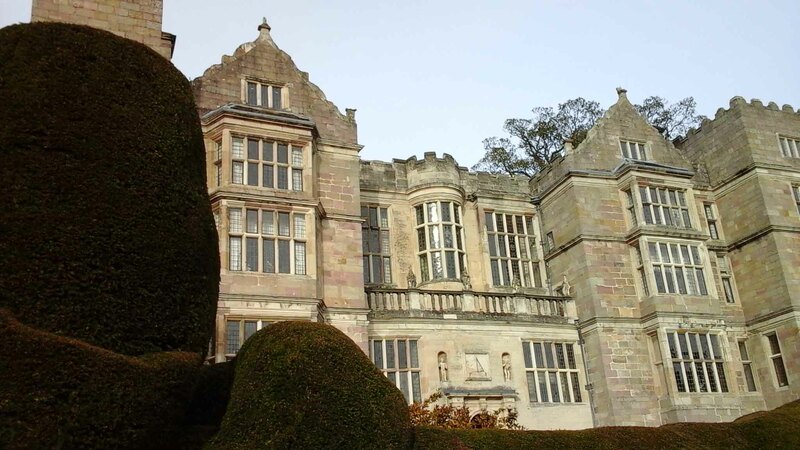 It was he who had Fountains Hall constructed – which he was living in by 1604. But it was not until much later that the owner of the neighbouring Studley Park, William Aislabie, was able to purchase the Abbey Estate in 1767, so combining the two. I won’t go into detail about this, except to say that the lake and water gardens that we walked around, with their follies and statues, were all part of the work done by the Aislabie family. It was they who also had all the rubbish cleared out of the Abbey Church. The deer park and St. Mary’s church are also part of Studely Park. Unfortunately, we didn’t get to see any deer rutting, although it’s the right time of year. A couple of stags had a little confrontation, but one of then soon backed off, so that was that. 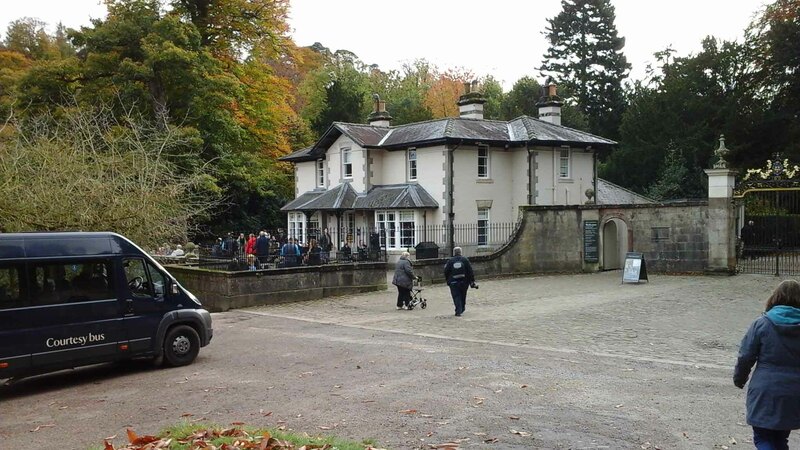 The building next to the lake which is now the Studley Tea Rooms dates back to 1860 and was probably built for the estate stewards of the first Marquess of Ripon. 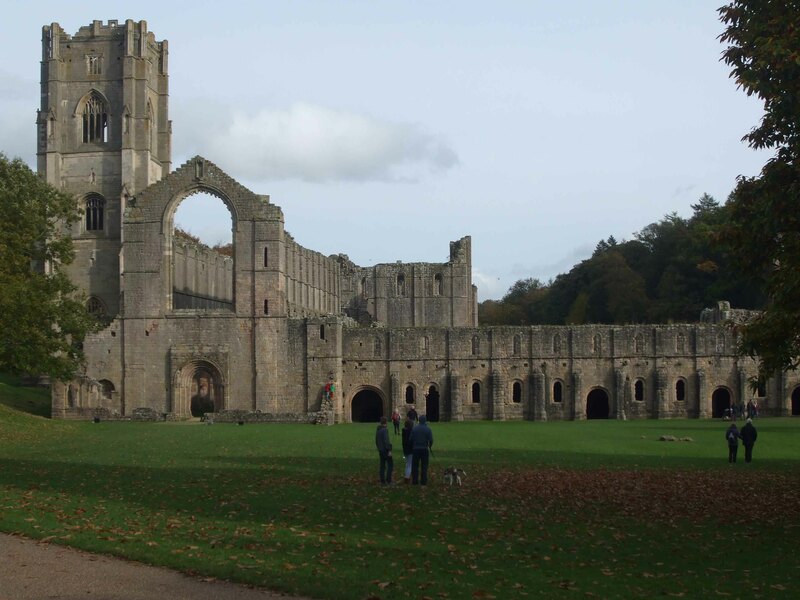 For a visit to Fountains Abbey and Studley Royal Park (the whole area is designated a World Heritage Site) you need a whole day. The Park alone has much to see, and a visit to the Mill takes a while – which we didn’t do this time. 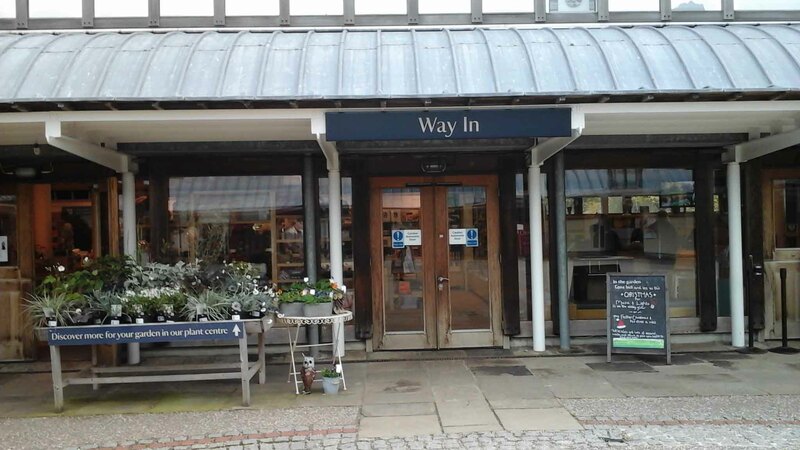 There’s a restaurant at the Visitor Cente at the main entrance, and a couple of tea rooms around the site. 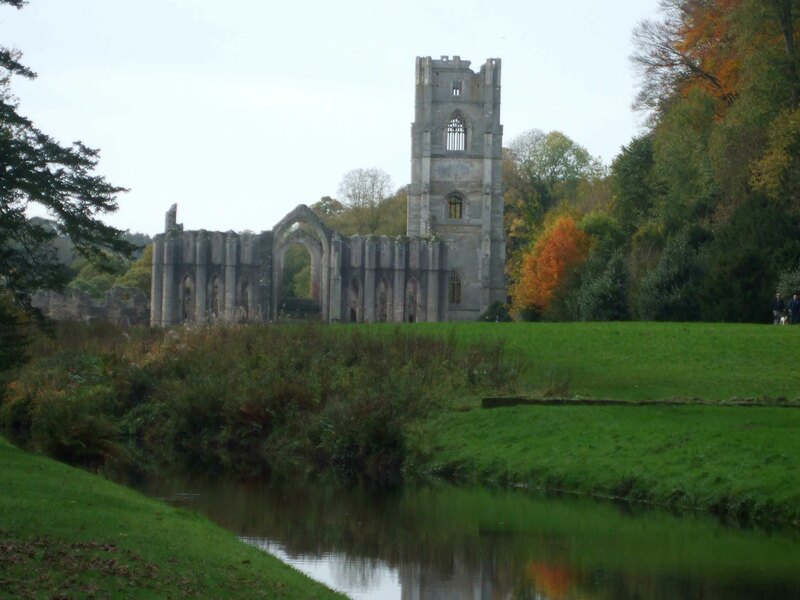 Then, of course, there’s Fountains Abbey itself… Well worth taking time over. And if you’re members of either The National Trust or English Heritage, entrance is free. If you’d like to see some additional, super photos from around the site, take a look at Louise’s post at thestorytellersabode. Next A Piece of Flash and a Frog. Spectacular I love every photo!! It’s so beautiful, the architecture, landscape and wildlife!! Those ruins are amazing. Thanks so much for sharing your photos of them! I get such a sense of how huge and stately the buildings must have felt in their prime. As always, I try imagining what they looked like when they were still intact and being used. I see so many of these old ruins rootless and open to the air, with only bare stone left, I sometimes forget how often they would have been dark when the roofs were on and the colored glass still in the windows, lit by lamps or candles and filled with colorful decorations and tapestries. I agree, it’s hard for us to imagine how these huge buildings were lit up at night with just candles and oil lamps. I think there would have been flaming torches set around the walls, too, as there were in castles – although the frugal monks may have thought that too extravagent! I imagine the monastery and Abbey Church may have had colourful tapestries in places showing religious scenes from the Gospels – or even from the O.T. Beauty for the glorification of God would have been their aim, after all. Perhaps the monks’ quarters would not have been decorated at all. Cistercians were very austere. Such huge, stone structures always look so oppressive… and almost intimidating, somehow. It’s vey hard for us to imagine them brimming with the activity of a thriving community. Gorgeous! Oh how I envy your access to these places, Millie! Monastery ruins, charming tea rooms, all of England’s walks like the Cotswold Way. I’m partial to the Cistercians because I grew up not far from an active Cistercian Abbey called Gethsemene in Bardstown, Kentucky, which was where Thomas Merton lived much of his monastic life. Two of the notable Cistercian Abbeys in northern Spain (should you go back to Spain in the North) are the Abbadia Cisterciense in Canas and Las Huelgas in Burgos. Thank you for telling me about Thomas Merton, Beth. That’s something for me to look up tomorrow. (It’s almost midnight, so I’m off to bed very soon!). The Cistercians fascinate me, and I need to find out more about them. I’d love to go to Northern Spain and Santiago de Compostela. but I don’t think it will be next year. We already have a few things planned for then. I’ll brchecking out posts I’ve missed this week tomorrow, so if you’ve posted, w can chat again then. Best wishes to you. Millie. Hi Beth. I know it seems strange that I’m contacting you on this post, but I’ve been trying to get to your blog for the last couple of days and can’t. I only thought of this tonioght (Sunday). I can’t get into your blog by following your link. It takes me to a page that says ‘Blog not found’ or something like that. I’ve been hoping you’d post, so I could get in that way, but I haven’t seen a post in my Reader – although I could well have missed one. If you have posted something, could I ask you to send me the link to it – either here of on my last post? Many thanks in advance. Thank you so much Ane. It is a lovely place to visit. Brilliant post. One of my favourite places in the whole world. We’re visiting tomorrow night for one of their floodlit evenings. It’s usually very atmospheric. That sounds fantastic, Martyn. I’ve not been to a floodlit evening in Britain, but I can imagine how brilliant one would be at a place like Fountains. We went to a similar thing at an Egyptian temple, although that was billed as a ‘Light and Sound’ show. It was brilliantly lit up, so that’s how I imagine Fountains will be. Will you be doing a post about it? I’d love to know what it’s like. I love the history and the pictures are also amazing! Wow sleeping beneath an elm tree! Wonderful post as always. Sounds like a fun day with your lovely daughter! We had a lovely day, thank you, Lynn. The weather was kind to us and we photographed everything in sight!. 🙂 I’ll be catching up on posts tomorrow when I’m not doing one myself. Have a lovely weekend, Lynn. You too dear! I loved this one and the pictures and history were fantastic! Fantastic post, Millie! What a lot of work has gone into this. I especially love the photos of the Stag, and the exposed tree roots. You really seem to have a gift for photography. I must look into buying a National Trust membership for my mum. She’d love to go to places like this! Yes, it’s good to have membership to either (or both) The National Trust or English Heritage. We use them so often on our travels about the country. Many historical sites are either one or the other. As for the stag… there were a few stags around and we really hoped to see a rut. But they obviously weren’t in the mood for confrontations that day. Last time we went up there in October, we saw a great rut. And the striking, exposed tree roots were all along that particular route. I’ve got lots of photos of different ones, and so has Lou. I didn’t know you’d lived in Yorkshire.I lived near Doncaster when I first started teaching. I met Nick there – he’s a Yorkshireman through and through. We moved down to Wantage when we got married in 1970. Thank you for the nice comment. Ha! Mine’s a Yorkshireman too. Went to uni in Leeds and met my hubby just after I’d finished. I lived there ten years in total. Lovely eldest was even born there. The Leeds area has some lovely countryside around it. I wasn’t too keen on ‘Donny’ as they call it up there, and was only there for three years. I did like the little mining town I taught in, though (Stainforth). There was some lovey countryside around it, and plenty of birds and small mammals. Devon is glorious – so picturesque. We were only in Crediton a very short while before deciding to come back up here. Our older children were all still up here, you see, and we didn’t like being that far away from them. I’ve never been to Doncaster itself, although it’s never had a reputation for being picturesque. I don’t like being so far from the girls, but while they’re so young no point moving to be near as they may well up sticks five minutes later. Eldest has real wanderlust – she spent six moths in Australia and 18 in NZ so now she’s in the Netherlands, I actually think she’s close! I remember you all met up over there not long ago. She certainly has got a bad dose of the travel bug. She’ll probably want to settle somewhere eventually. You’ll just have to hope it isn’t in NZ. Oh yes, you’ve barely reached altitude when the plane starts descending again. Beautiful photos Millie. I enjoyed the post as well. Absolutely love this post – I even re-read it to remember. Thank you for sharing this piece of history and outstanding photography. The gallery looks stunning – reminds me of the ruins I visited in Edinburgh. I imagine the place running – simple life, simple chores, prayers and peace. Oh, you’ve described it just as I visualise it, too. I’ve been to Fountains many times. When I taught in Newark in the 90s, we used to take Year 7 students up to Hadrian’s Wall every year for a week. On the way up, we always stopped at Fountains and then at Durham Cathedral to do some medieval work before we started on Romans at the Wall. The children (and we teaching staff!) used to get all dressed up as monks, and the educational crew at Fountains led us round and put us to work – just like monks for an hour or so. It was very strict, and no talking whatsoever. It really gave us a feel of life in a strict, Cictercian monastery. Very peaceful indeed. I still go up there with family at least once a year – and to Hadrian’s Wall. Like you, Inese, I love the natural world and I love history. My photography is very much in its infancy stage, though. I’ve done very little of it until recently.Thank you so much for liking my post. Thank you for your work! I have learned so much reading your blog! Magnificent photos and explanations. I feel as if I’ve been there with you, but now I want to go myself. Thanks, Peggy.It’s easy for us to do in a day, so we can (and do) visit quite often. There are some wonderful old abbeys up in Yorkshire. Rievaulx Abbey is similar. Now I just have to get myself to Britain. One of these days. Oh, I know I’ll make it, just not sure when. Thank you so much for your appreciation…. I loved yours and your daughter’s photos. It was the next best thing to being there. Thank you, Dinata! Like you, we all love travelling about to interesting places in our family. Louise is a far better photographer than I am. I’m just a novice, with only my Samsung tablet. Lou has a good camera and has been taking photos since she was about eight. Fountains is a wonderful place. I’m so in awe of the architects and builders involved in the construction of these huge buildings, without the use of modern machines etc. Such skill. Knaresborough is lovely, too. Mother Shipton’s Cave is there. We’ve only been once,so we’re due for a revisit soon. Harrogate is a great town, famous for its ‘Betty’s’ ( a tea rooms) amongst other things. There’s a Betty’s in York, too, but the Harrogate one is more famous. Both heve queues down the road. I can’t say I’ve ever heard of Betty’s Tea Rooms (another one for Lorna – https://lornastearoomdelights.wordpress.com/ ). Thank you Millie 🙂 When I looked up Skipton, it didn’t feel right, I felt it was further north. The Skipton you’ve mentioned is the one I was thinking of 🙂 With its Carboniferous Limestone!!! Hi Clare. I hope you’ve now made great headway with your new library, and no longer tired and dirty. 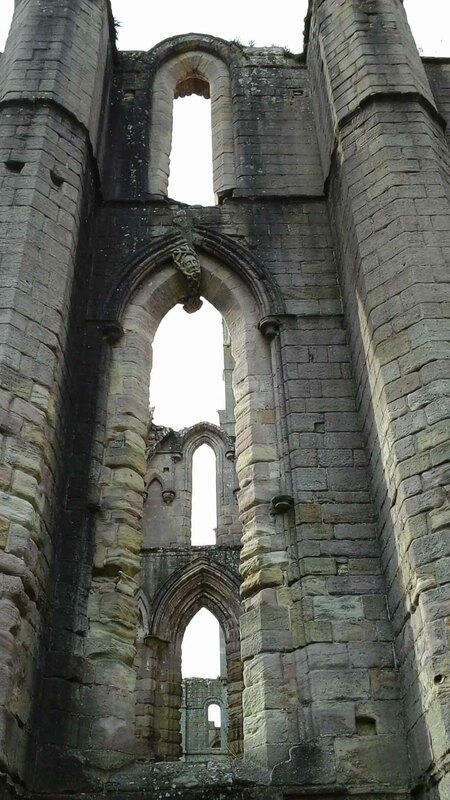 Thank you for reading and liking the Fountains Abbey posts. Autumn was a lovely time of year to visit there, too. As I think I mentioned, I’m trying to stay off my blog at the moment. I really need to find a better way of balancing my writing with blogging. It’s generally one or the other with me. Hence the blogging break. I’m looking forward to coming back and reading some of your posts, too. I daren’t start browsing now or I’ll never get back to my book. I hope you’re coping well with the blizzards. You’re not in for an easy time, but I hope you all keep safe. I heard on the news the advice about staying indoors, so I imagine you’ll be doing a lot of that for a while. Do take care.